This new image of galaxy cluster MS 0735.6+7421 is part of a collection of new images released from the Chandra archive to celebrate American Archive Month. The galaxy cluster MS 0735.6+7421 is home to one of the most powerful eruptions ever observed. X-rays detected by NASA’s Chandra X-Ray Observatory (blue) show the hot gas that comprises much of the mass of this enormous object. Within the Chandra data, holes, or cavities, can be seen. 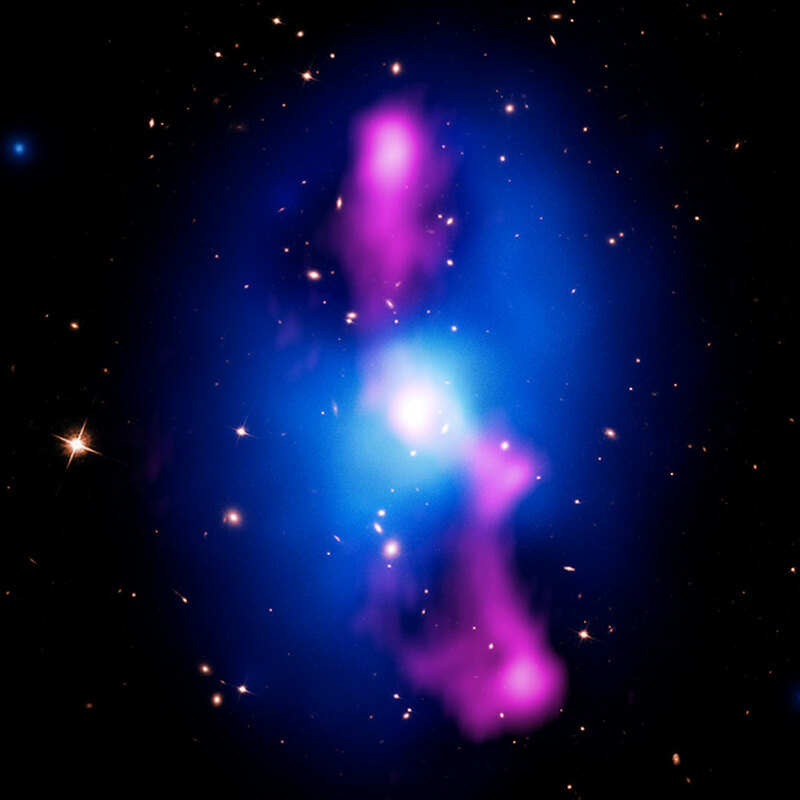 These cavities were created by an outburst from a supermassive black hole at the center of the cluster, which ejected the enormous jets detected in radio waves (pink) detected by the Very Large Array. These data have been combined with optical data from the Hubble Space Telescope of galaxies in the cluster and stars in the field of view (orange). This image is part of a collection of new images released from the Chandra archive to celebrate American Archive Month. Archives, in their many forms, save information from today that people will want to access and study in the future. This is a critical function of all archives, but it is especially important when it comes to storing data from today’s modern telescopes. Chandra has collected data for over sixteen years on thousands of different objects throughout the universe. Once the data is processed, all of the data goes into an archive and is available to the public. Be the first to comment on "New Chandra Image of Galaxy Cluster MS 0735.6+7421"